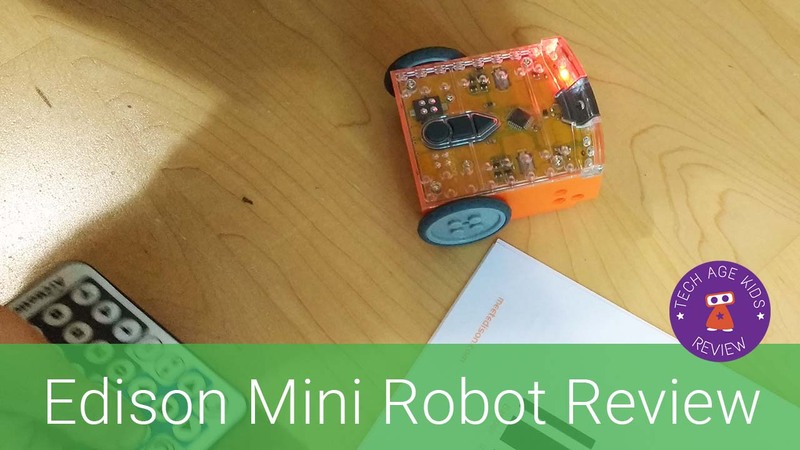 Edison is a mini orange robot with LEGO compatible attachment points. 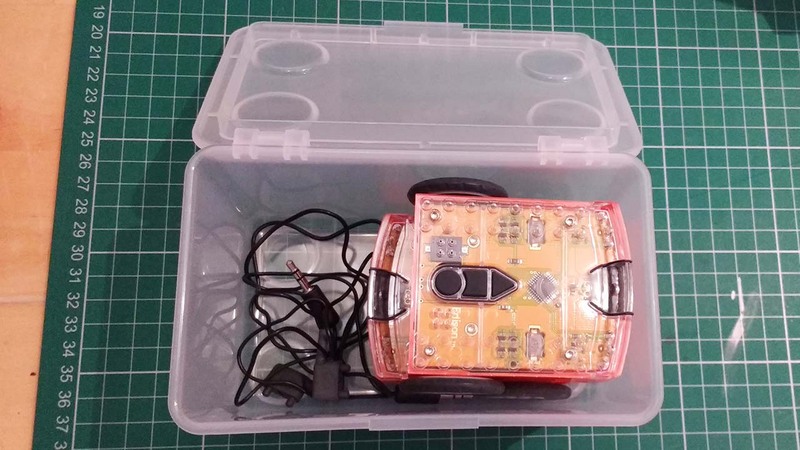 Edison is inexpensive and can be used at school or home to teach kids basic robotics. The new Edison version 2.0 has just been announced. Isn't that just typical! We've just got our Edisons and there's a new version out. The new ones also have wheel encoders for more more precise movement, a clutch mechanism that prevents damage, improvements to the sensors and more storage space. 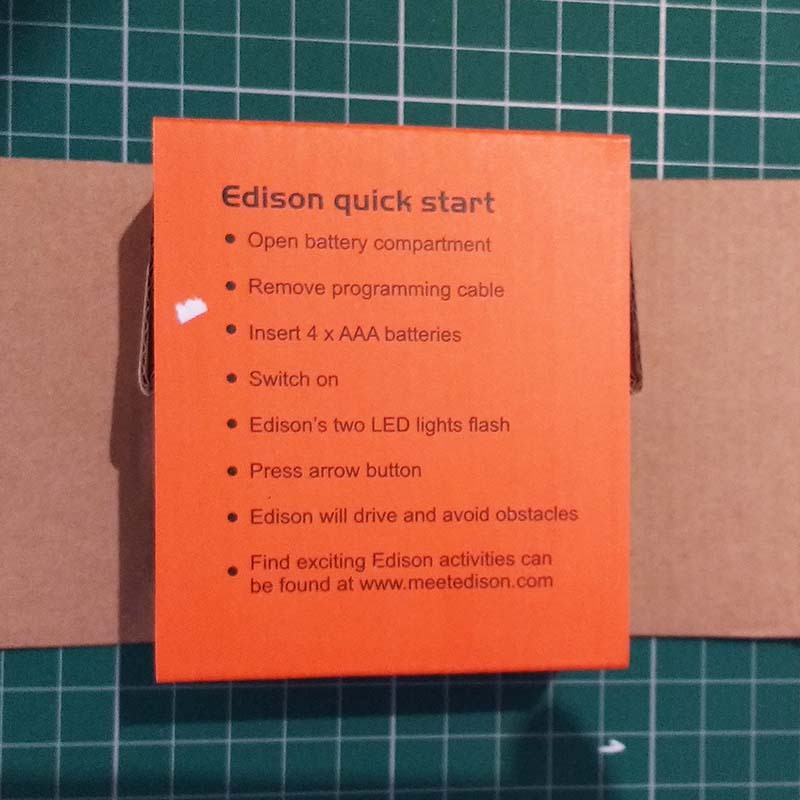 The first thing you'll notice is that Edison comes in a tiny box. We bought two of them as some of the projects use two robots working together. There's no wasted space in the box. The programming cable is stored inside the battery compartment. My 9 year old was very impressed with this bit of ingenuity. The boxes aren't really usable for storage as it's tricky to put them back together. Ours are living in a small IKEA storage box. We've tried using rechargeables and they do work. It's worth having a spare set so you can have some charging while the others are in use. Pre-programmed modes that can be activated by driving over a bar code. Ability to program to respond to a regular remote control. LEGO compatible attachment point that allow machines to be built using Technic LEGO parts. Free educational lesson plans and tutorial books. Out of the box Edison is set to obstacle avoidance mode. My kids loved putting their hand in front of the little robot and seeing it change direction. One of our robots went round in circles initially, we made sure there was nothing obstructing the wheel and things improved. There's an introductory booklet that takes you through Edison's pre-programmed modes. This is great for getting to know what the robot can do. The first mode is 'clap control'. You drive Edison over a bar code (by pressing the round button three times) to put it into clap control mode. We didn't find it responded well to actually clapping, but slapping the wooden floor near the robot worked really well. My boys had lots of fun with this, especially trying to synchronise two robots. You can even program Edison to respond to button presses on a remote control. We used the remote control from the Sparki robot as well as the one from a TV and it worked really well. Edison has its own graphical programming software called EdWare. EdWare is available for Windows, Mac, Linux, iOS (iPad), Android, Chrome and Raspberry Pi (with an external speaker.) That's the way to remove barriers to being able to use the robot! Very convenient. We've also used it on Windows. EdWare is pretty easy to use for simple programs. Text-based programming was a missing feature from Edison. This has been added for version 2.0. But it looks like it will also be available for those of us with the older Edison robot, it says 'Coming Soon' on Ed.Py, the web-based Python programming tool for Edison. This is a great feature and really takes Edison into older age groups. We'll certainly be exploring this in future. 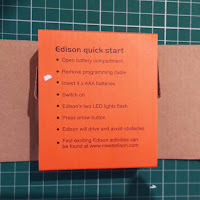 Edison is a great introductory robot for a low budget and for use in small spaces. Two Edisons would work well as gifts for siblings or friends as there are projects that use two of them. You can do a lot with just one Edison though. Programming Edison via the cable isn't as convenient as programming via Bluetooth, and you have to be careful not to lose the custom cable, but this approach keeps the price down. LEGO compatibility is a big plus for this robot. Like lots of families we have boxes and boxes of LEGO and it's good to find ways to use it that appeal to my kids now they are getting older. The new version 2.0 Edison robots have improved motor protection which should allow more experimentation without damaging the robot motors. We really like that Edison allows kids to explore programming and construction of robots. The high-quality educational material that comes with Edison means that kids are much more likely to make full use of it. Edison Mini Robot is listed as Contempo Views Lego Compatible Educational Robot on Amazon US.